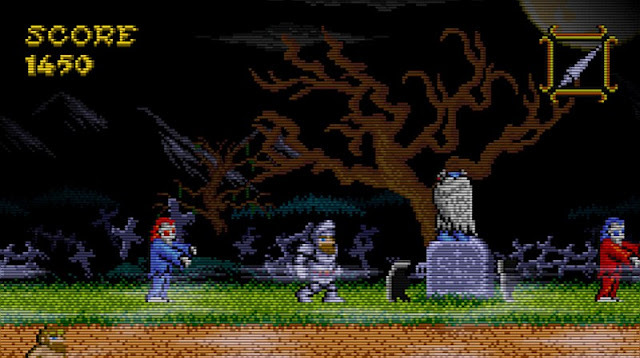 Indie Retro News: Ghosts 'n Demons - Ghosts 'n Goblins adaptation for the Dreamcast! Ghosts 'n Demons - Ghosts 'n Goblins adaptation for the Dreamcast! It's once again a very late hour here on Indie Retro News, but that didn't stop us from writing a rather eye opening news release for the Dreamcast that has just been sent to us by Retrotaku. This is of course Ghosts 'n Goblins, or shall I say an adaptation of that game titled Ghosts 'n Demons by BonusJZ. In celebration of the 30th anniversary of the release of Ghosts Goblins, you once again play as Sir Arthur, a knight on a quest against evil forces. You must rescue Princess Prin Prin's who has been kidnapped and fight way through dozens of enemies such as Demons, Ghosts and Zombies! Before you get too excited and think this is the full version, it is at the moment a test release and as such the developer is really hoping for your feedback on the forums.